Islamabad, September 09, 2018:-Realigning the goals of China-Pakistan Economic Corridor (CPEC), Pakistan has introduced new targets of socio-economic and regional development under this unprecedented mega project. 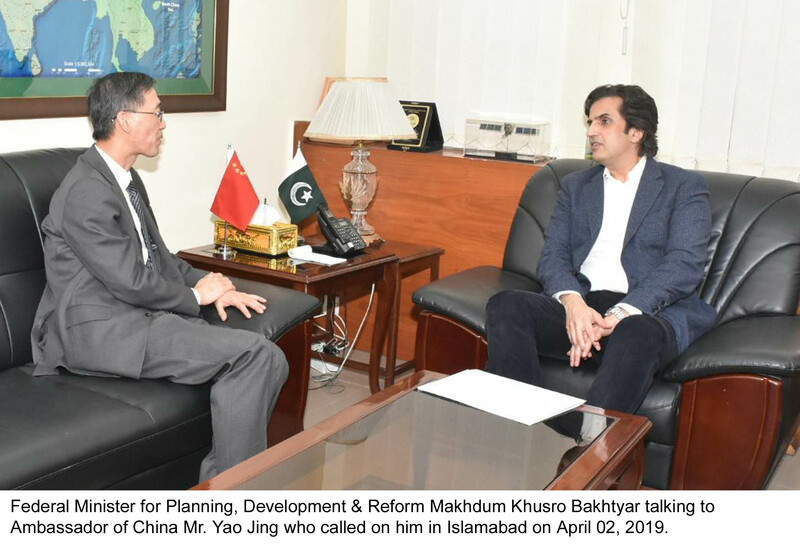 “This development initiative would prove as a bright future for Pakistan”, expressed Minister for Planning, Development & Reform (PD&R), Makhdum Khusro Bakhtyar in a marathon session with his counterpart, the Vice Chairmen National Development and Reform Commission (NDRC) of China Ning Jizhe here on Sunday in Islamabad. Secretary Planning, Zafar Hassan, Project Director CPEC, Hassan Daud and officials from NDRC as well Chinese Embassy also attended the meeting. Reaffirming the present government’s commitment on CPEC, Minister PD&R categorically said that all out efforts to be made for the success of this project of economic development and prosperity. CPEC is a reality and bright future of Pakistan, aimed at initiating a modern era of trade and economic growth, he added. He said that new dimensions are being added to take CPEC to further height. 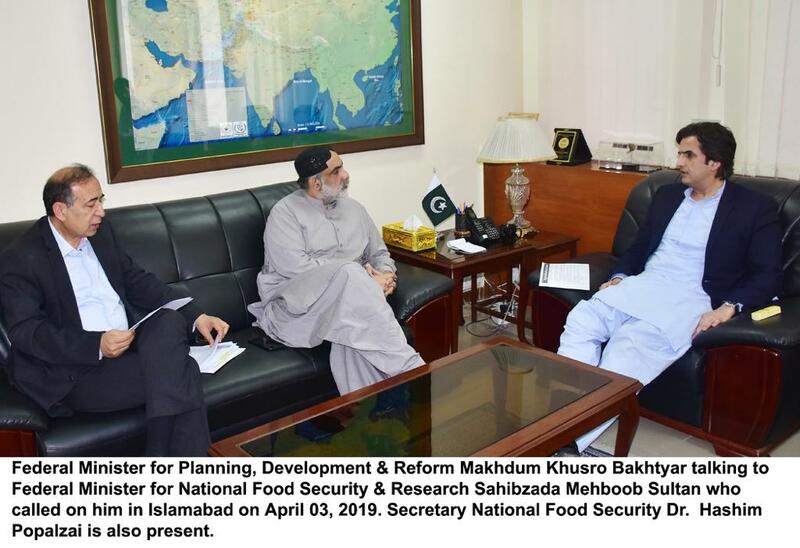 “To achieve the new set targets, the government is dedicated to put all energies together to make progress at the earliest,” Makhdum Khusro Bakhtyar reiterated. During the meeting, both the sides expressed their agreement that CPEC- an icon of Built and Road Initiative (BRI) is an engine of rapid growth in Pakistan and manifestation of Pak-China relations that would further promote inclusivity. Both the countries agreed on introducing a mechanism to ensure 3rd country participation in CPEC. Minister PD&R, Makhdum Khusro Bakhtyar said that the present government accords top priority to the development of Gwadar as a stand-alone project. The Port City is going to be transformed as a transshipment hub and a center for industrialization with a special focus on heavy industries with a kind of incentives that produce a high rate of return, he added. Industrial cooperation is the main area of attention where efforts are being made to encourage relocation of Chinese industries with a purpose to ensure rise in export and maximize employment opportunities, Minister PD&R said. 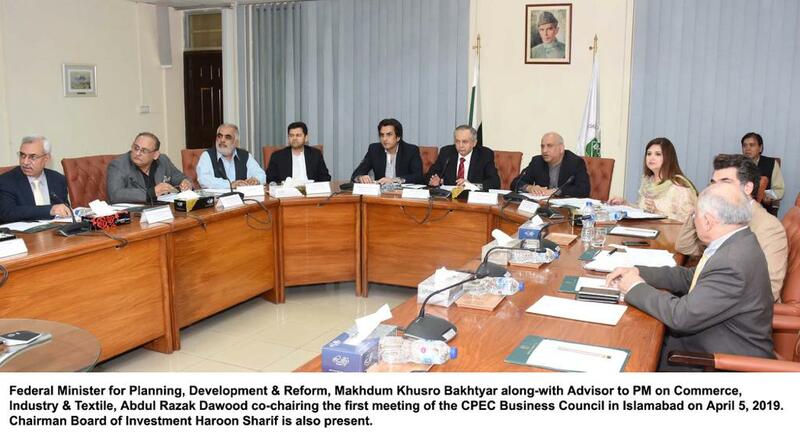 He highlighted that progress on special economic zones under CPEC has been expedited and investors from all across the world are encouraged to populate these parks. Mr. Bakhtyar said that the government intends to encourage projects based on indigenous sources of energy including Thar Coal, hydel and renewables as the choice of local energy sources would reduce our import bill and guarantee cheaper energy. On this occasion, the Vice Chairman NDRC, Mr. Ning Jizhe has lauded government’s agenda and efforts for social and economic development of Pakistan and reiterated his commitment that Chinese companies would effectively work for completion of CPEC projects. He agreed to work closely with the new government to achieve the set targets. The two sides decided to further expedite development projects in Gwadar and to ensure groundbreaking of New Gwadar International Airport, Technical Institute and Hospital this year. Pakistan and China have reached on a conclusion to develop transport infrastructure projects. اجلاس کے دوران دونوں ممالک نے اس بات پر اتفاق کیا کہ بیلٹ اینڈ روڈ کا سب سے نمایاں منصوبہ سی پیک پاکستان میں تیز تر معاشی ترقی کیلئے ایک انجن کی حیثیت رکھتا ہے اور اس منصوبے کی تکمیل میں اجتماعیت کو مزید فروغ دیا جائے گا، فریقین نے سی پیک میں تیسری فریق کی شمولیت و سماجی و معاشی ترقی کے حصول کیلئے ایک میکانزم قائم کرنے پربھی اتفاق کرلیا.